Although this was a day when I had very limited chase options because I could not get away from work until around 5 p.m., I managed to intercept a massive HP supercell near Union, MO this evening around 6:30. I headed out around 5 to try to intercept the HP I had been tracking since before my 4 p.m. meeting at work. The storm I originated in eastern Kansas or far west Missouri, and really got going in Pettis Co., MO just SE of Kansas City. Interestingly, that was an area where I had chased just two days earlier, Sunday, May 4, managing to see no tornadoes on the big outbreak day. Today's supercell continued across MO, leading to an evacuation of the state capitol during a TOR warning in Jefferson City and producing a long swath of hail and damaging winds and occasional brief tornado touchdowns as it moved along a more or less stationary front across Missouri. 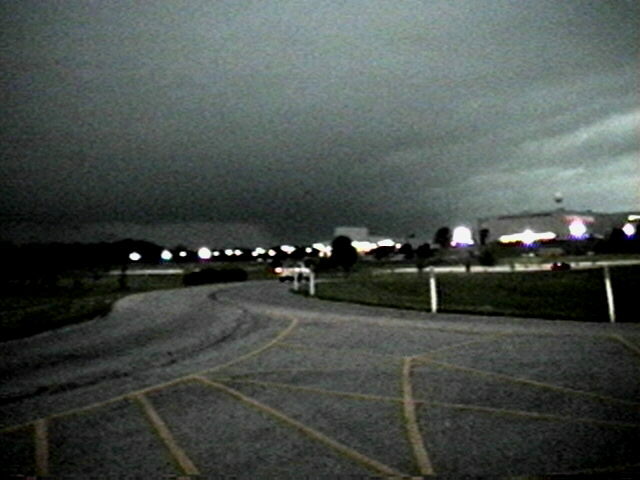 The storm eventually (after I chased it) moved into IL south of the STL metro area, where it evolved into a bow echo and developed a very pronounced rotating bow head after dark in Randolph Co, IL. But I am getting ahead of myself. I headed out around 5 with cirrocumulus clouds overhead and the anvil spread out to the west and north of Edwardsville. By this time, the radar was indicating a line of supercells (mostly HP) extending southwest from Gasconade County. Movement was generally to the east, or slightly south of due east. I wondered if they would tend to turn more to the SE. The anvil rapidly spread over the sky as I crossed into St. Louis, with very pronounced mammatus that I never did get a picture of because I was focused on vectoring myself toward the storm as soon as possible. 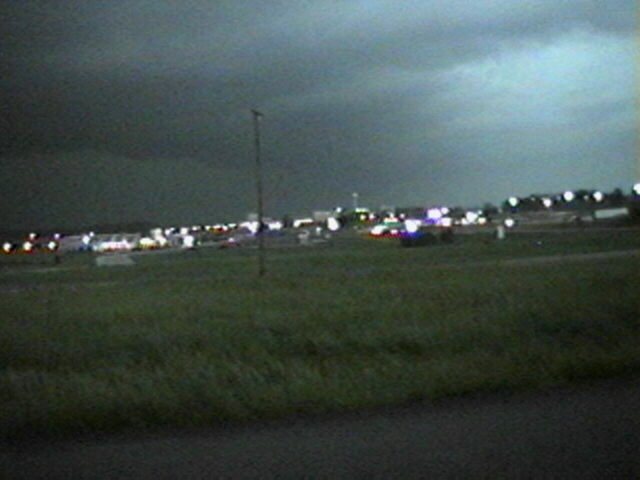 By the time I had passed I-270 heading WSW on I-44, it was evident the storm was very electrified as lots of in-cloud lighting was visible. Soon I could also see a flanking line extending to the south, and a couple very strong updraft towers going up into the anvil to my SW and WSW. 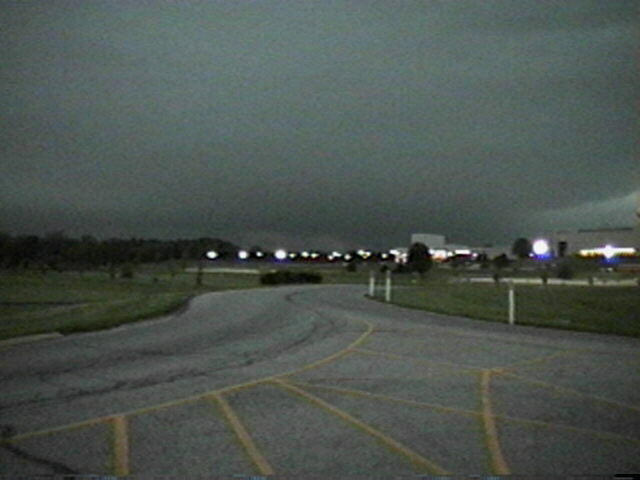 Arond this time, a TOR warning was issued for Franklin County. My initial plan had been to cut west on U.S. 50 toward Union (in Franklin Co.), and intercept the storm near or west of there, and this plan was still looking good. 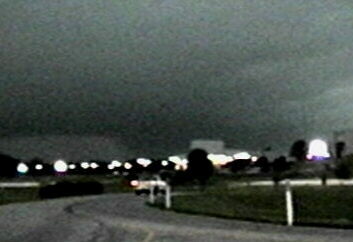 By the time I was approaching Union, I could begin to see the HP meso to my W or WSW, and the sky rapidly darkened. I decided that if I went west of Union I might compromise my escape route due to delays getting back east through town, so I found an open spot at the entrance to the East Central College campus at the southeast edge of town. I got there around 6:10 or 6:15, and was at or near that location for about 20 minutes. As the storm got closer, I noticed two things. First, there was some kind of rain-wrapped lowering, but it was really only visible with lightning so it was very difficult to tell what it was. Second, the inflow into this HP beast was incredible. I was right under an inflow band that was racing westward into the storm - the westward cloud movement in this inflow band was very noticeable and pronounced. 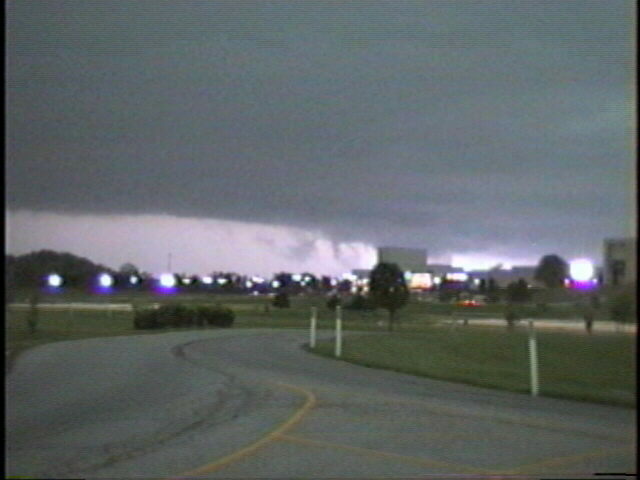 As the storm approached, the inflow from the east increased to a strength that I would estimate was around 40-50 mph. Since there was a traffic light and a bit of a backup at the intersection of the N.S. road at the east edge of the campus and route 50, I repositioned to another side road about a half mile east, on the other side of a small strip mall, where I could quickly dart onto route 50 to bail east when the time came. As I repositioned, I passed a police officer and a spotter who had stopped to chat briefly about the storm. I got some additional video from my new position, which was about a half mile east of my initial position. The lowering that I observed from both positions was near the north part of the intense precip core under the HP meso, near where the inflow band was racing into the meso. I cannot say with any degree of certainty what it was. It was persistent - from my video I would say it lasted at least 5 minutes and probably quite a bit longer, since I was turning the camera on and off so I didn't watch the storm entirely through my viewfinder. I got three pretty good video captures of it, all illuminated by lighting. In this one, while it was still pretty far away, it is in the right-center part of the picture, just left of the white building. It looks pretty solid and appears to extend most of the way to the ground, but it is still quite far away. In the next one, taken about a minute later and more zoomed, the lowering still looks solid and very low. [The contrast on this image is enhanced to make the feature easier to see.] A minute or so later, though, in the third image, the lowering appears to have at least two parts, neither of which extends to the ground, and it appears that the part on the left could be scud. I am not sure about this, though, because the lighter color at the top could be the background or it could be the front side of the lowering illuminated by the lightning. The part on the right does appear to be attached to the parent cloud, and there could be more of the lowering that is hidden by the building on the right. Added 5-19-03: With a new and better video camera purchassed this past weekend, I am now able to play frame-by-frame and get better captures. 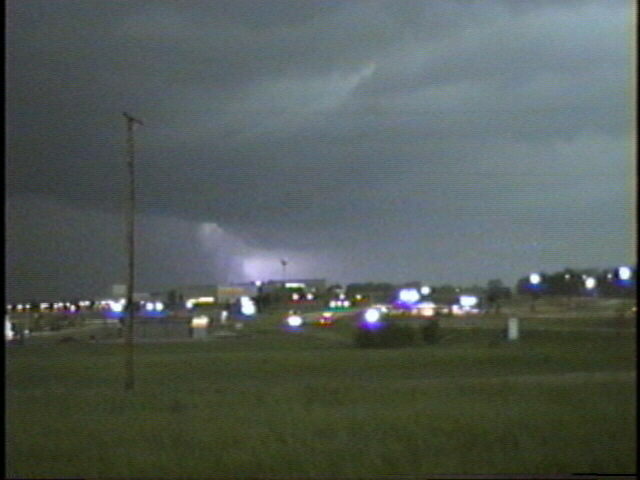 This one, with the lightning at maximum brightness, confirms that the part on the left is scud, but the part on the right appears to be attached - possible funnel? Also, there do indeed appear to be additional lowerings behind the building on the right. These four vid caps are from the time I was in my first position, at the entrance to the college. The lowering was illuminated once more by lightning while I was at my second position a half mile or so east. This time, it was either front lit or the lightning was right along the edge of the lowering, because it appeared brighter than the background rather than darker. Added 5-19-03: With the new camera I am able to capture this feature. VERY interesting rain-wrapped lowering which appears to be located right in the notch of the HP supercell! It appears large and it appears to extend to or near the ground, and looks quite distinct from the precipitation area to the left. I am not sure what this is, and obviously since it was illuminated only for a split second by the lighting, I cannot say whether it was rotating. But it certainly looks suspicious. Although I do not really know for sure what this lowering was, it was roughly in line with possible touchdowns reported to the west in Mt. Sterling and to the east in Robertsville, and with the track of rotation detected by the LSX WSR-88D radar. I waited until I was about to be overrun, as I saw the trees to my west starting to disappear in the precip and then bailed east, fighting the intense inflow that required some concentration to drive against. Around the time I left, a new TOR warning was issued for Jefferson Co., the county east and southeast of Franklin. This final video capture shows the area where the inflow band intersected with the HP meso. 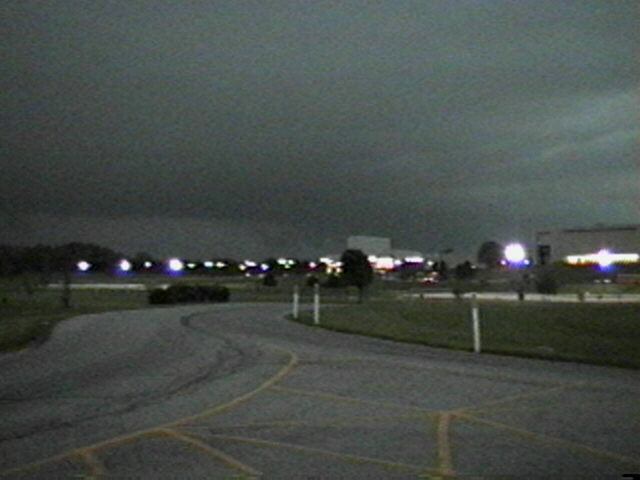 The clouds in the upper right of the picture were part of the inflow band, and were rapidly moving west into the meso. The lowering in the previous pictures, visible only when there was lightning, would have roughly behind the telephone pole in this picture. After I retreated east, I never really could get position on the storm again without being somewhere I would get crunched. About 15 minutes after I left union, the TOR warning was extended for eastern Franklin Co., with radar indicating the possible tornado having passed union, located just to its southeast near Moselle. For reasons elaborated on below, I gave up and went home after I had backed east to Eureka and gassed up, which I needed since I was under 1/4 tank. In retrospect I probably should have stopped and observed the storm a bit more from the Gray Summit exit - especially since a brief tornado was reported in Robertsville, located a few miles directly south of Gray Summit. However, at the time I did not do so, because I did not think I could stay there long, and was thinking about repositioning somewhere with better visibility farther east. However, the farther east I got, the more directly north I would have to go from the viewing location to get home, which mean't an increasing chance of ending up in the hail core. Hence, I decided to go home after gassing up. One thing I didn't realize was the extent to which the movement of the storm was slowing. When I was approahing the storm, its movement was reported as toward the east at 45 mph. Each subsequent warning and sever wx statement slowed it down, eventually to movement of only 25 mph as indicated in this severe weather statement. This seems to be verified by the times on the local storm reports. According to the LSRs the storm dropped golfball hail in Union and blew down numerous trees and power lines there and throughout Franklin Co. The LSR also indicated that the storm later produced a tornado in Robertsville, a little east of Union. There may also have been another tornado earlier in Mt. Sterling, as indicated in a severe wx statement. Union also got 2 inches of rain, and I-44 was closed by flooding near St. Clair. I initially believed the storm that caused major damage in De Soto was two storms south of my storm. Apparently, it turns out that two storms, both producing downburst winds of 80-100 mph, caused most of the damage. The southernmost storm moved across the area first, entering Jefferson Co. from Washington, Co.; it was followed by the next storm north, entering from Franklin Co. - could have been my storm, but more likely was the next storm north. Together, they created a downburst path about 10 miles wide, and caused most of the damage in De Soto. About 10% of the damage thee was attributable to two F0 tornadoes. The full damage assessment from the NWS for Jefferson Co. can be found here. My last two chases now have been in the hills and trees of MO. I would welcome some storms on the flat open praries of IL rather than the wooded hills of MO! Still, this was my best chase so far this year, especially considering that I could not start until 5 p.m.
1. Pay careful attention to changes in storm motion. This one really slowed down, which means that once I retreated east, I had more time to get back in position and see it again than I thought I did. The storm did produce a tornado a while after I left, and I might have had a chance to see it had I stopped at Gray Summit and watched for a while. I didn't because I thought the storm was still moving too fast to make that worthwhile. Total chase distance: about 140 miles.